Cabinet minister Amber Rudd has told the BBC she is “committed to making sure we avoid” a no deal Brexit and would not rule out resigning over it. The work and pensions secretary said she was “going to wait and see” whether the prime minister allowed MPs a free vote on potential options next week. Labour MP Yvette Cooper has tabled an amendment to delay Brexit if no deal is reached by the end of February. MPs heavily rejected the deal Theresa May agreed with the EU last week. The UK is due to leave the EU at 23:00 GMT on 29 March and the prime minister has faced repeated calls to rule out the prospect of leaving without a deal, if no agreement can be reached. She says it is not within the government’s power to rule it out – but various backbench MPs will try to move amendments to postpone Brexit if no agreement can be reached, when the Commons votes on a way forward next Tuesday. 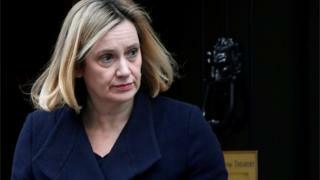 Ms Rudd returned to the cabinet in November, less than seven months after quitting as home secretary in April 2018 over the Windrush scandal. She told the BBC’s Newsnight that she wanted MPs to get a free vote on the various amendments – but would not say if she would resign her ministerial post to back an amendment from Labour’s Yvette Cooper. The amendment would give time for a bill to suspend the Article 50 process for leaving the EU to the end of the year, if a new deal has not been agreed with Brussels by the end of February. Ms Rudd said the “best outcome” was for MPs to support Mrs May’s deal and “every day in Parliament we hear about MPs who voted against the withdrawal agreement who are reconsidering”. Pressed on whether she would quit to block no deal, she said: “I think it’s too early for anyone to make those sort of commitments because at the moment there is a lot of change going on. Meanwhile ,Chancellor Philip Hammond told an audience of business people on Thursday: “In the 2016 referendum, a promise was made to the majority who voted for Brexit – that they were voting for a more prosperous future. 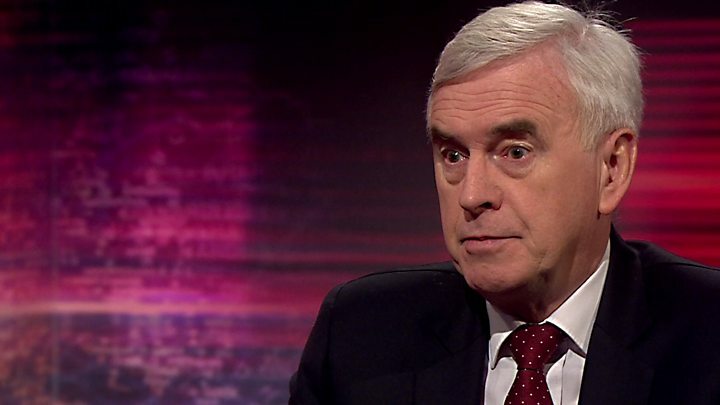 Labour’s shadow chancellor John McDonnell said: “The chancellor must now surely consider his position in the government. “Philip Hammond’s comments today demonstrate he has acknowledged the damage a no-deal Brexit would do to our economy, jobs and living standards. It comes as aerospace giant Airbus warns that it could move its wing-building operations out of the UK if no Brexit deal is reached. Later Airbus senior vice president Katherine Bennett was asked on Sky News whether the government had put the company up to issue warnings about the consequences of a no-deal Brexit. She said: “No, the government didn’t. The government have been talking to us and other industry representatives all the time, of course, and we’ve given them lots of information about the potential impacts. Theresa May met union leaders on Thursday as she continues to seek support for her Brexit deal, ahead of a crucial Commons vote on Tuesday. Last week the withdrawal deal negotiated with the EU was rejected by MPs by a historic margin – 432 votes to 202. The prime minister is hoping to tweak her deal to address concerns about the “backstop” among her own backbenchers and Northern Ireland’s Democratic Unionist Party, which she relies on to keep her in power, ahead of another vote on her proposed way forward next Tuesday. The backstop is the “insurance policy” in the withdrawal deal, intended to ensure that whatever else happens, there will be no return to a visible border between Northern Ireland and the Irish Republic after the UK leaves the EU. But it has proved controversial with many MPs on her own side who argue it keeps Northern Ireland too closely aligned with the EU, and that the UK could be permanently trapped in the arrangement. However as well as Yvette Cooper’s amendment, her Labour colleague, Rachel Reeves, has also tabled an amendment to extend Article 50. Other amendments would ask the government to consider a range of options over six full days in Parliament before the March deadline, to set up a “Citizens’ Assembly” to give the public more say or to insist on “an expiry date to the backstop”. Plans by a group of Tory and Labour MPs to table an amendment on another EU referendum have been dropped, after they admitted they didn’t have sufficient backing from MPs, although the Lib Dems will be tabling an amendment calling for a “People’s Vote”. It will be up to Speaker John Bercow to select amendments to put to the vote.